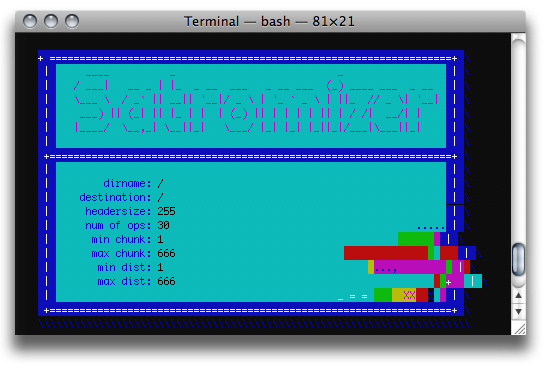 MAKE IT EXECUTABLE: $"chmod +x satromizer_c.pl"
headersize: HOW BIG DO YOU THINK THAT HEADER IS? num of ops: HOW MANY CHUNKS DO YOU WANT TO SHUFFLE? min chunk: THE SMALLEST CHUNK SIZE. max chunk: THE LARGEST CHUNK SIZE. min dist: THE SMALLEST DISTANCE (IN BYTES) TO SHUFFLE THE CHUNKS. max dist: THE SMALLEST DISTANCE (IN BYTES) TO SHUFFLE THE CHUNKS. If you use it or modify it, drop me a line [jon AT this domain]. I'd love to see your stuff!